The observations scatter plot in Output 109.1.1 shows a rather uniform distribution of the locations in the study domain. 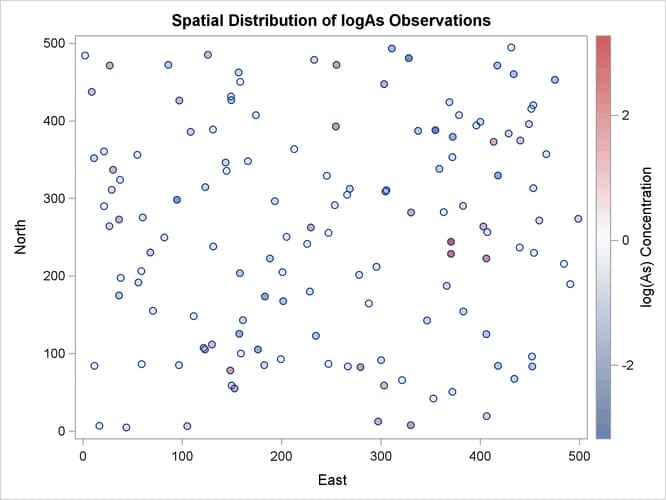 Reasonably, neighboring values of logAs seem to exhibit some correlation. There seems to be no definite sign of an overall surface trend in the logAs values. You can consider that the observations are trend-free, and proceed with estimation of the empirical semivariance. 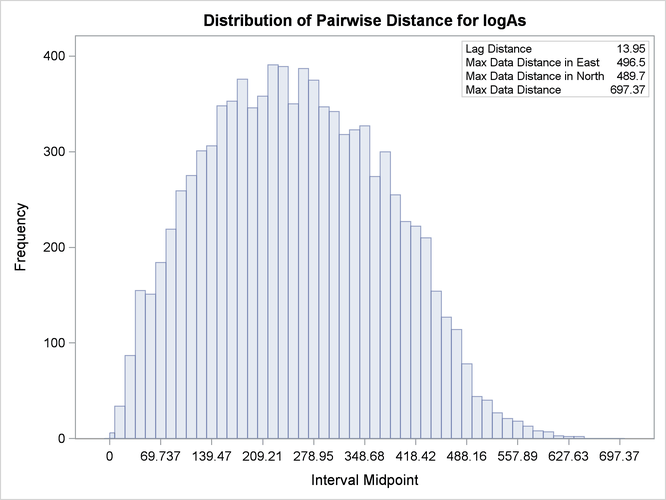 Based on the discussion in section Preliminary Spatial Data Analysis, the pair distance plot in Output 109.1.2 suggests that you could consider pairs that are anywhere around up to half the maximum pairwise distance of about 700 km. 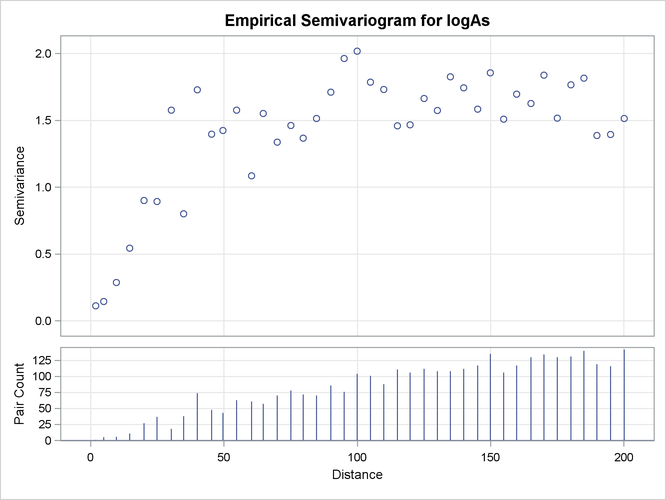 The first few lag classes of the logAs empirical semivariance table are shown in Output 109.1.3. Output 109.1.3 and Output 109.1.4 indicate that the logarithm of arsenic spatial correlation starts with a small nugget effect around 0.11 and rises to a sill value that is most likely between 1.4 and 1.8. The rise could be of exponential type, although the smooth increase of semivariance close to the origin could also suggest Gaussian behavior. You suspect that a Matérn form might also work, since its smoothness parameter can regulate the form to exhibit an intermediate behavior between the exponential and Gaussian forms. The table of general information about fitting is shown in Output 109.1.5. 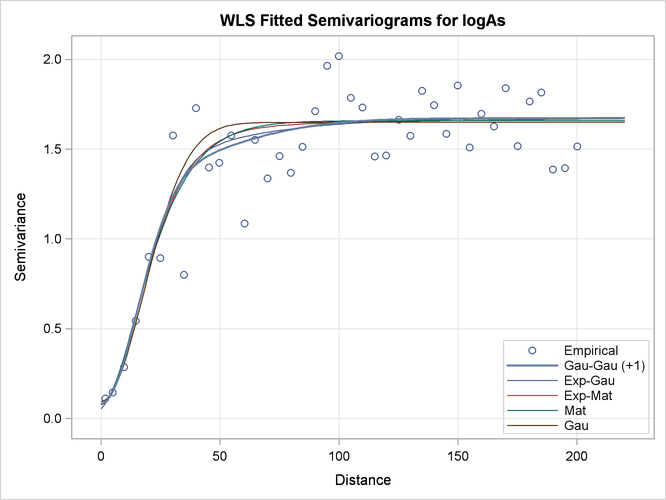 The table lets you know that 12 model combinations are to be tested for weighted least squares fitting, based on the three forms that you specified. The combinations include repetitions. For example, you specified the GAU form; hence the GAU-GAU form is tested, too. The model combinations also include permutations. For example, you specified the GAU and the EXP forms; hence the GAU-EXP and EXP-GAU models are fitted separately. According to the section Nested Models, it might seem that the same model is fitted twice. However, in each of these two cases, each structure starts the fitting process with different parameter initial values. This can lead GAU-EXP to a different fit than EXP-GAU leads to, as seen in the fitting summary table in Output 109.1.6. The table shows all the model combinations that were tested and fitted. By default, the ordering is based on the weighted sum of squares error criterion, and you can see that the lowest values in the Weighted SSE column are in top slots of the list. Note the leftmost Class column in Output 109.1.6. As explained in detail in section Classes of Equivalence, when you fit more than one model, all fitted models that compute the same semivariance are placed in the same class of equivalence. For example, in this fitting example the top ranked GAU-GAU and GAU-MAT nested models produce indistinguishable semivariograms; for that reason they are both placed in the same class 1 of equivalence. The same occurs with the EXP, GAU-EXP, EXP-EXP, and MAT-EXP models in the bottom of the table. By default, PROC VARIOGRAM uses the AIC as a secondary classification criterion; hence models in each equivalence class are already ordered based on their AIC values. Another remark in Output 109.1.6 is that despite submitting 12 model combinations for fitting, the table shows only 10. You can easily see that the combinations MAT-GAU and MAT-MAT are not among the listed models in the fit summary. This results from the behavior of the VARIOGRAM procedure in the following situation: A parameter optimization takes place during the fitting process. In the present case the optimizer keeps increasing the Matérn smoothness parameter in the MAT-GAU model. At the limit of an infinite parameter, the Matérn form becomes the Gaussian form. For that reason, when the parameter is driven towards very high values, PROC VARIOGRAM automatically replaces the Matérn form with the Gaussian. This switch converts the MAT-GAU model into a GAU-GAU model. However, a GAU-GAU model already exists among the specified forms; consequently, the duplicate GAU-GAU model is skipped, and the fitted model list is reduced by one model. A similar explanation justifies the omission of the MAT-MAT model from the fit summary table. In our example, the nested Gaussian-Gaussian model is the fitting selection of the procedure based on the default ranking criteria. Output 109.1.7 displays additional information about the selected model. In particular, you see the table with general information about the Gaussian-Gaussian model, the initial values used for its parameters, and information about the optimization process for the fitting. The estimated parameter values of the selected Gaussian-Gaussian model are shown in Output 109.1.8. The default fit plot for the current model comparison is shown in Output 109.1.9. The legend informs you there is one more model in the first class of equivalence, as the fitting summary table indicated earlier in Output 109.1.6.